The types in this module will change settings inside a Oracle Database. No changes are made outside of the database. Take the code from “https://github.com/hajee/oracle&#8221;. To use this module, you need a running Oracle database. I can recommend Edwin Biemonds Puppet OraDb module. The Oracle module itself is based on easy_type. After you have a running database, (See Edwin Biemonds Puppet OraDb module), you need to install easy_type, and this module. tablespace, oracle_user, role and listener. Here are a couple of examples on how to use them. This is the only module that does it’s work outside of the Oracle database. It makes sure the Oracle SQL*Net listener is running. The name of the resource MUST be the sid for which you want to start the listener. All types have a name like sid\resource. The sid is optional. If you don’t specify the sid, the type will use the first database instance from the /etc/oratab file. We advise you to use a full name, e.g. an sid and a resource name. This makes the manifest much more resilient for changes in the environment. This type allows you to manage a user inside an Oracle Database. It recognises most of the options that CREATE USER supports. Besides these options, you can also use this type to manage the grants and the quota’s for this user. This type allows you to manage a tablespace inside an Oracle Database. It recognises most of the options that CREATE TABLESPACE supports. This type allows you to create or delete a role inside an Oracle Database. It recognises a limit part of the options that CREATE ROLE supports. This type allows you to create or delete a service inside an Oracle Database. At this point in time the type support just the creation and the removal of a diskgroup. Modification of diskgroups is not (yet) supported. this type allows you run a specific SQL statement or an sql file on a specified instance. This statement will execute the sql statement drop table application_users on the instance names instance. There is no way the type can check if it has already done this statement, so the developer must support this by using puppet if statements. This statement will run the sqlscript /tmp/do_some_stuff.sql on the instance named instance. Like the single statement variant, there is no way to check if the statement is already done. So the developer must check for this himself. When you don’t specify the username and the password, the type will connect as sysdba. This type allows you to enable a thread. Threads are used in Oracle RAC installations. This type might not be very useful for regular use, but it is used in the Oracle RAC module. This module is tested on Oracle 11 on CentOS and Redhat. It will probably work on other Linux distributions. It will definitely not work on Windows. As far as Oracle compatibility. Most of the sql commands’s it creates under the hood are pretty much Oracle version independent. It should work on most Oracle versions. This is an open projects, and contributions are welcome. Obviously Oracle has many many many more DBA objects that need management. For some of these Puppet would be a big help. It would be great if we could get help getting this module to support all of the objects. If you have knowledge in these technologies, know how to code, and wish to contribute to this project, we would welcome the help. 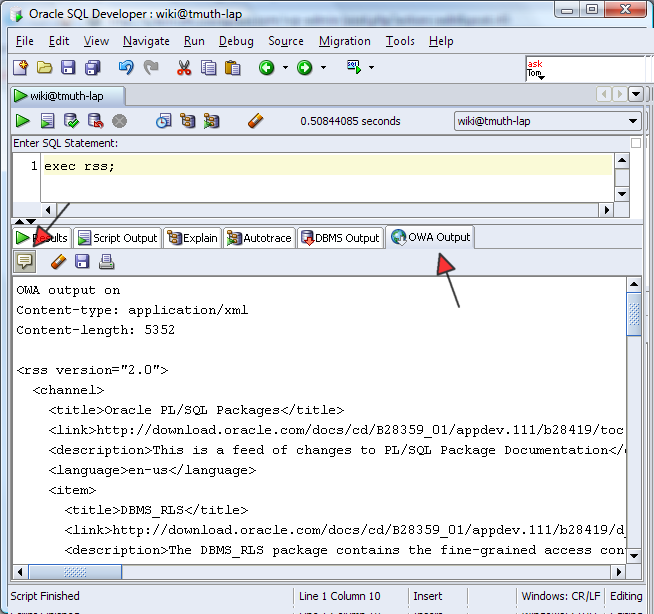 The dcli utility executes commands across a group of servers on Oracle and returns the output. The dcli utility executes commands on multiple Oracle Big Data Appliance servers in parallel, using the InfiniBand (bondib0) interface to make the connections. You can run the utility from any server. The dcli utility requires a passwordless Secure Shell (SSH) between the local server and all target servers. You run the dcli utility on the local server, and the commands specified in dcli execute on the target servers. Connect to an Oracle Big Data Appliance server using PuTTY or a similar utility. Select an SSH connection type. You see the message “ssh key added” from each server. You can now run any ssh command on any server in the rack without entering a password. In addition to dcli commands, you can use scp to copy files between servers. This topic identifies some of the basic options to the dcli command. To see the dcli help page, issue the dcli command with the -h or --help options. You can see a description of the commands by issuing the dclicommand with no options. You can identify the servers where you want the commands to run either in the command line or in a file. For a list of default target servers, use the -toption. To change the target servers for the current command, use the -c or -g options described in below table. rack-hosts-infiniband is the default target group of servers for the dcli, setup-root-ssh, and remove-root-ssh utilities. The file initially contains the default factory IP addresses. The network configuration process changes this file to the custom IP addresses identified in the Oracle Big Data Appliance Configuration Worksheets. cluster-hosts-infiniband contains the names of all servers in the Hadoop cluster created by the Mammoth Utility. A cluster can span one or more Oracle Big Data Appliance racks. You can manually create additional files with groups of servers that you want to manage together. For example, you might manage servers 5 to 18 together, because they have no special functions like servers 1 to 4. You typically specify a command for execution on the target servers on the command line. However, you can also create a command file for a series of commands that you often issue together or for commands with complex syntax. See the -x option in below table. You can also copy files to the target servers without executing them by using the -f option. You can request more information with the -v option or less information with the -n option. You can also limit the number of returned lines with the --maxlines option, or replace matching strings with the -r option. Following are examples of various output levels using a simple example: the Linux date command. The output from only one server (node07) is shown. The syntax in these examples issues the date command on all 18 servers. This is the default output, which lists the server followed by the output. The options described in below table. You can omit all options to run a command on all servers. Any command that runs from the operating system prompt. If the command contains punctuation marks or special characters, then enclose the command in double quotation marks. The backslash (\) is the escape character. Precede the following special characters with a backslash on the command line to prevent interpretation by the shell. The backslash is not needed in a command file. See the -x option for information about command files. target servers. The files are not executed. See the -l option. or IP addresses can be used in the file. -k Pushes the ssh key to each server’s /root/.ssh/authorized_keys file. -l userid Identifies the user ID for logging in to another server. The default ID is root. command executed on multiple servers. The default is 10,000 lines. -n and -r options together. See your Linux documentation for more information about vmstat. and executed on the target servers. See the -l option. 0: The command ran successfully on all servers. 1: One or more servers were inaccessible or remote execution returned a nonzero value. A message lists the unresponsive servers. Execution continues on the other servers. 2: A local error prevented the command from executing. If you interrupt the local dcli process, then the remote commands may continue without returning their output or status. Following are examples of the dcli utility. Transportable Tablespaces helps to copy one or more tablespaces from one Oracle Database to another. Starting with Oracle Database version 11g, transport tablespaces can be used to migrate database from one platform to another. This includes transporting tablespaces acrosse platforms with differemt endian formats. Oracle database 12c Realease 1 comes with the possibility to use backupsets and image copies to transport data between platforms. The new clause “ALLOW INCONSISTENT” in a BACKUP or CONVERT command creates a cross-platform inconsistent backup of one or more tablespaces. You can create an inconsistent backup of the tablespace when the tablespace is still in read/write mode. The first inconsistent backup is a level 0 incremental backup. Then, you can create multiple cross-platform level 1 incremental backups. The final cross-platform incremental backup must be a consistent backup which requires bring the tablespace in read-only mode. – Perform a Cross-Platform Transport of Tablespaces Using consistent Backupsets. – Perform a Cross-Platform Transport of Tablespaces Using Inconsistent Backupsets. First, let’s create a new tablespace called “TBS_TRANSP”. We will move this tablespace from Oracle Enterprise Linux 64 bit to Windows 8 64 bit. and those outside of the tablespace. and the tablespace is self-contained. Check if plateforms supported for cross-platform tablespace transport; note Microsoft Windows x86 64-bit is supported. Both databases must be COMPATIBLE set to 12.0 or greater. Bring the tablespace TBS_TRANSP in read only mode prior the TTS (Trasportable TableSpace) process. IMPDP> Source timezone version is +00:00 and target timezone version is -05:00. Check if the tablespace exists. Note: the same per-requisites we have seen in the previous chapter must be used here as well. First, let’s create a new tablespace called “TBS_TRANSP_2″. Let’s take a full 0 backup of the TBS_TRANSP_2. Because FOR TRANSPORT is used instead of TO PLATFORM, this cross-platform backup can be restored on any platform. The conversion will be performed on the destination database. of the tablespace TBS_TRANSP_2 that contains the changes made since last backup. The tablespace is still in read/write mode. can be restored and applied on the destination database while the source tablespace is still in read/write mode. backup with the tablespace placed in read-only mode. before trying to move the backups to the destination host. called ‘tbs_incons_final_dest.dmp’ which be used later to import the metadata. to import the dump file containing the tablespace metadata in to the destination database. Source timezone version is +00:00 and target timezone version is -05:00. CHeck the table exists with its records.